Guess where I am right now? In the waiting room at the orthodontist’s office while J gets her braces off! Whoop, whoop! — Okay, well I started in the waiting room. But then J came out while they were creating her retainers and we had to analyze the dresses in People magazine instead. We agreed that lime green is not our favorite dress color choice and Lupita Nyung’o always looks fabulous, but besides that, there was not a great deal of consensus today. Anyway. The point is, we eat well, and the girls really appreciate eating well. Lately, though, we’ve taken it to the next level. Remember how I was talking about having yummy juice, and I said I might have to put a juicer on my wish list? The next day my friend called me and started with, “I read your blog.” The truth is, if a phone conversation starts with that phrase, my stomach drops. I assume I’ve irritated somebody, which I never intend to do, but I definitely do sometimes. But, phew, she was calling because she had a juicer that she never used, and she was gifting it to me! How awesome is that?!? I will tell you: it is super-awesome. I have been making positive juice ever since. Why, just this morning I dropped M off at school toting a jar full of the stuff, because a chilled and delightful-tasting burst of vitamins is an excellent coping mechanism when your first class of the day is pre-calc. This one’s actually not ideal because it’s sweetened. The girls can be pretty fussy about the labels. At Trader Joe’s there’s an unsweetened version, but I don’t have it handy because Trader Joe’s is inconvenient. 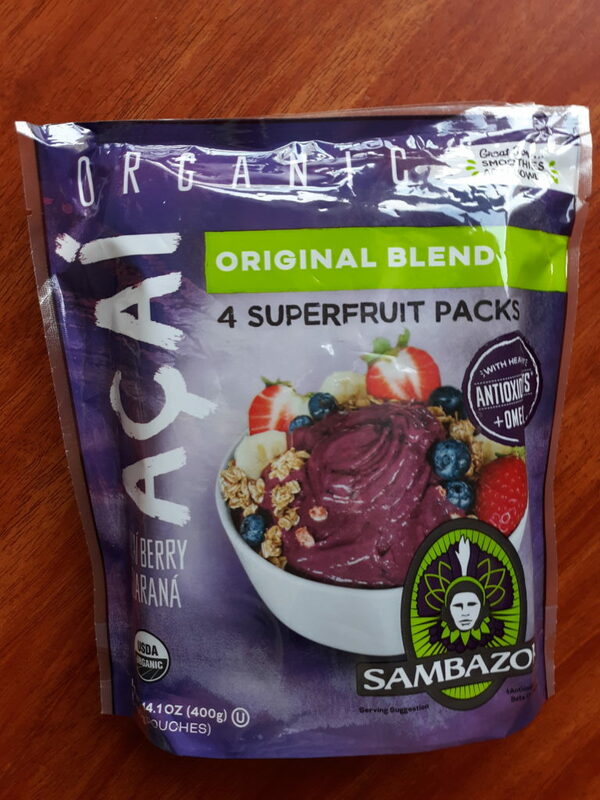 But now we can make our very own acai bowls at home! They are not as adorable as some of the ones from the store, but they’re still pretty yummy. 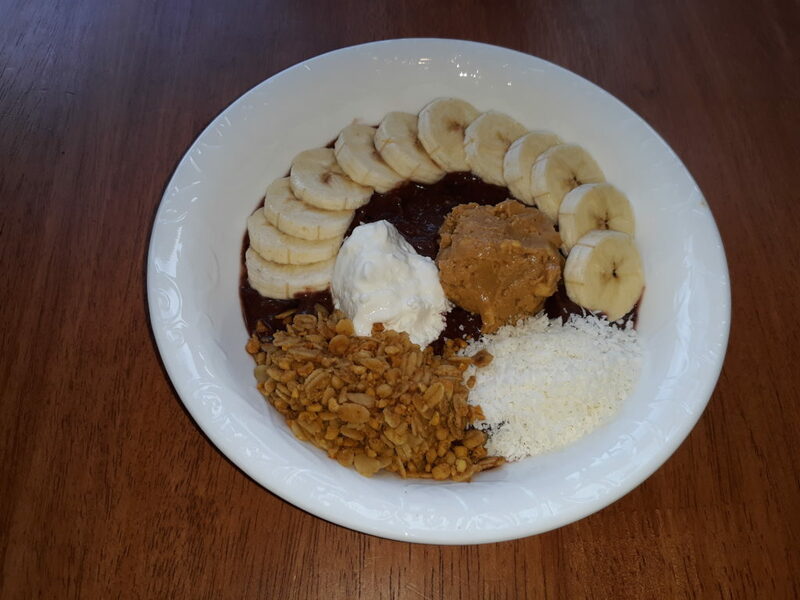 This one’s acai & cherries pureed with chia seeds and almond milk, then bananas, plain yogurt, peanut butter, granola, and coconut. The other day I noticed that Goya sells bee pollen, and I know that that’s one of J’s favorite mix-ins, so I might have to get us some. So we’ve got fresh juices and acai bowls, which is awesome, but if we want to be our own modern hipster cafe, you know what we still need, right? . . . . right? Of course you know! Avocado toast! While I, myself, have never gotten around to trying avocado toast (which I presume I would enjoy, given my deep enthusiasm for avocado), my kids became obsessive about avocado toast without warning. I would buy avocados to make some guacamole with a quesadilla dinner, and by the time quesadilla night would come around, the avocados would be gone. Or, worse, there’d be a disgusting brown quarter of an avocado that no one wanted to eat anymore. Oh! And J is constantly making herself custom-blended herbal teas with a huge variety of loose leaf teas that we’ve gifted her. Basically, we should probably open some sort of hipster cafe stand once the weather is nice. But if we do decide to do that, let me warn you: our menu is going to be expensive. Can you share the juices you are making? 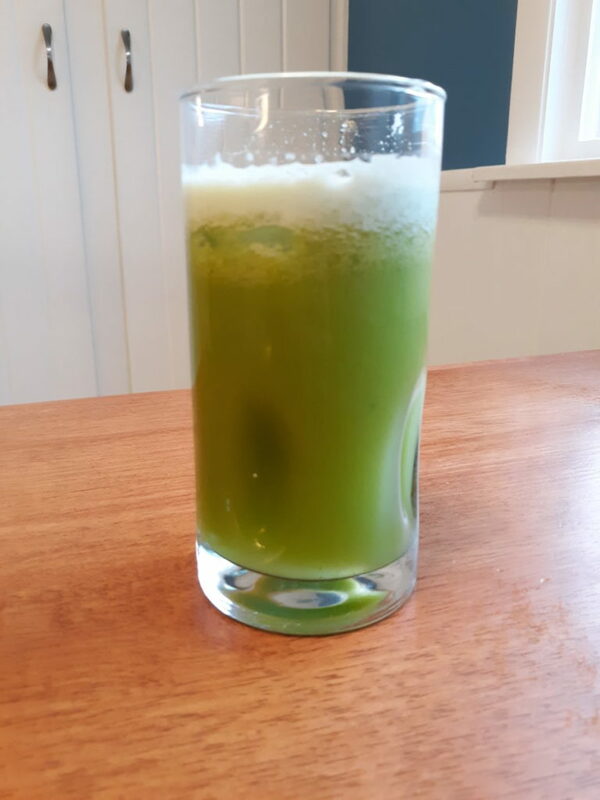 Hi Kimberly, the one that we can’t stop making is the Positive Juice from Wagamama, #10 on the list here: https://metro.co.uk/2016/01/05/12-drinks-for-dry-january-that-are-almost-as-good-as-alcohol-5602475/ which we first tried when we went to a restaurant during J’s volleyball tournament http://www.capitaldistrictfun.com/2019/02/27/february-break-2019/ — we should really try to branch out, and I keep meaning to, but we just like this one so much. Yesterday M went grocery shopping on her own just to get more ingredients! Ugh, Chuck, neither of my kids will eat peanut butter and jelly sandwiches! I try to tell them it’s a classic for a reason, but I have spoiled them beyond all the basic things that I thought were fantastic as a kid — I had a “relationship” in 6th grade that was based almost entirely on the boy providing me with Friehofer’s chocolate chip cookies and my kids wouldn’t touch a mass-produced chocolate chip cookie if it were served on a silver platter!